Powered by Playtech software, this exciting slot recreates the popular series from Marvel Comics. 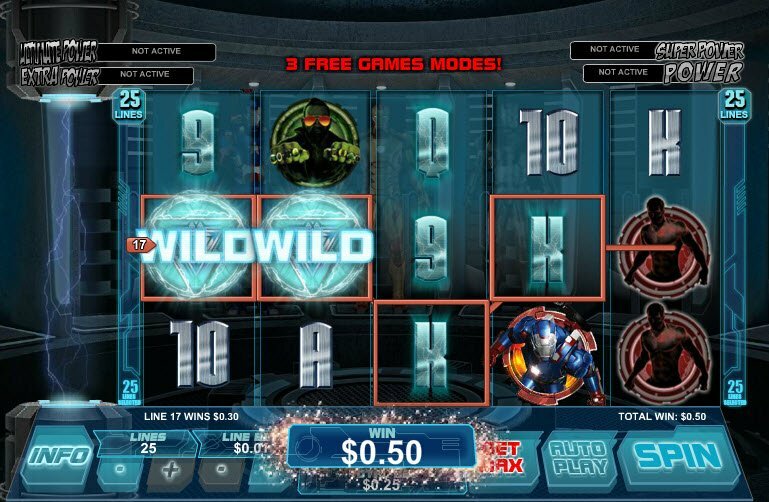 Iron Man 3 Slot Bonuses award unique symbols including Freezing Wilds, Random Wilds, and Dynamic Multipliers. What are these amazing new features? Read below to find out! 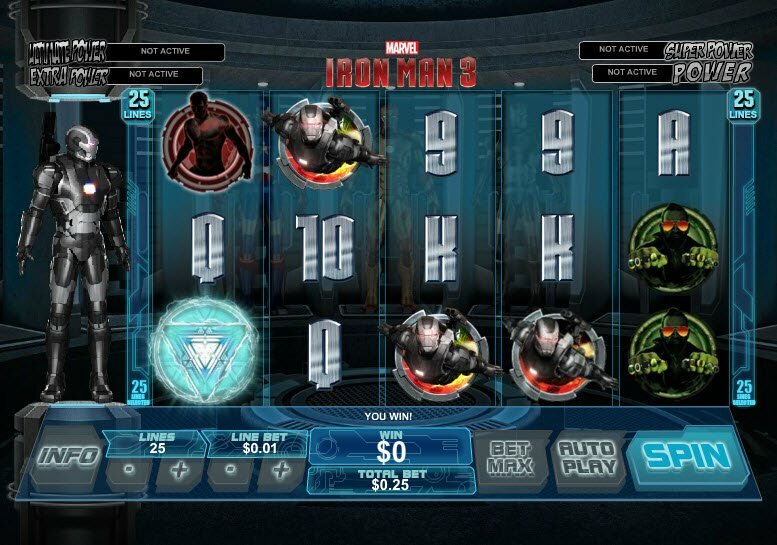 Marvel’s Iron Man 3 Slot consists of 5 reels and 25 paylines. Not only do the graphics completely capture the comic book theme, but the game contains lots of lucrative bonuses. 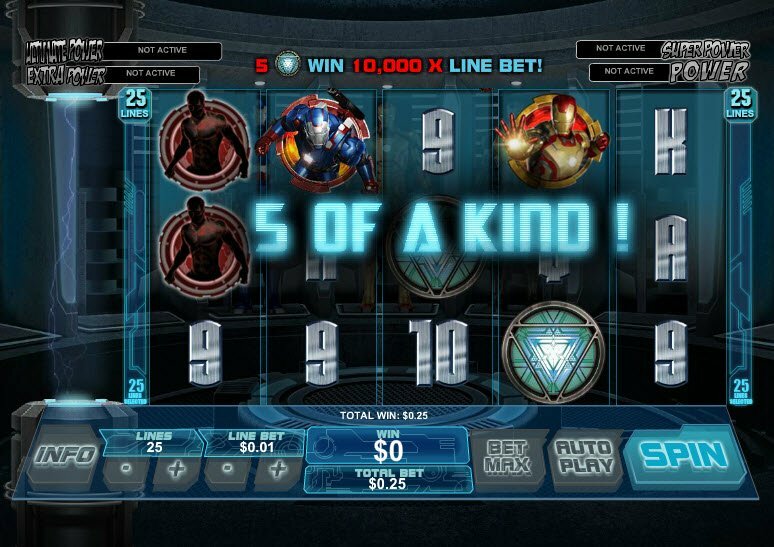 The slot machine gives you access to four Marvel Progressive Jackpots which guarantee a win for all players who enter. Play Iron Man 3 Slot to enjoy the excitement of Marvel Comic Books. Kryptonic Super Heroes flash across the screens in their mysterious costumes. When you achieve winning combinations, the icons light up and electrify. During game play, suspenseful music plays in the background adding to the thrill of the game. During the Free Games Mode, the Mark 42 Symbol awards 10 Free Games with Freezing Wilds, the War Machine grants 8 Free Games with Random Wilds, and the Iron Patriot gives 15 Free Games with a Dynamic Multiplier. Iron Man 3 Bonuses have a lot to offer. If the three super hero symbols appear on reels 1, 3, and 5, the reels re-spin. During the re-spin, the symbols pay 2 of a kind. The Iron Man 3 Slot gives you access to the Marvel Multi-level Mystery Progressive Jackpot. This links to Four Progressive Jackpots including the Power, Extra Power, Super Power, and Ultimate Power jackpots. Once you enter, all players are guaranteed to win. The Free Games Mode has some unique bonus symbols that make the game more exciting such as Freezing Wilds, Random Wilds, and Dynamic Multipliers. When 3 or more of the Iron Man logos show up on the reels, the game awards Free Games. You can also win additional free games. During the Free Games Mode, the Mark 42 awards 10 Free Games with Freezing Wilds, the War Machine grants 8 Free Games with Random Wilds, and the Iron Patriot gives 15 Free Games with a Dynamic Multiplier. What are all these interesting Iron Man 3 Slot bonuses? To find out, read below!